This is a terrific side dish for almost any meal. Roasting the beets and potatoes with the various seasonings brings out the savory flavor. It'll make your mouth happy! Roasted beets and gold potatoes really is a great side dish. 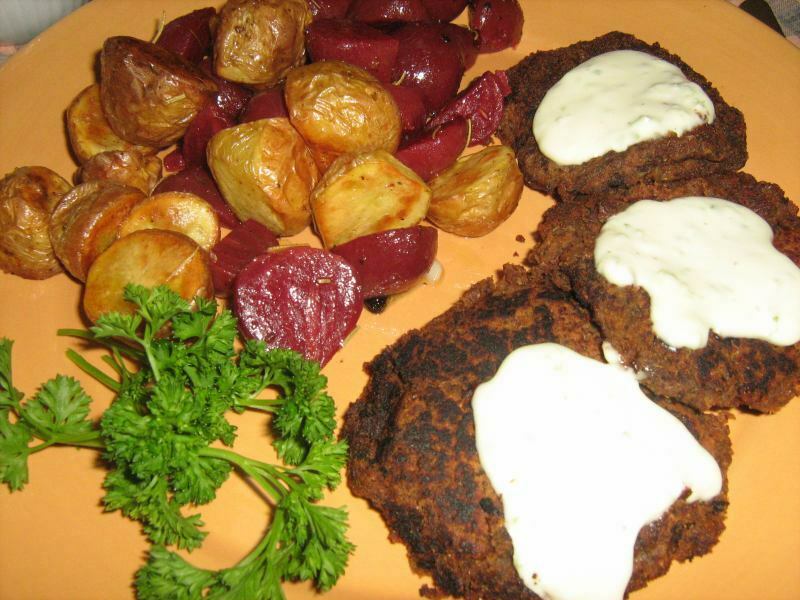 The flavor of the potatoes and beets is enhanced and made all the better by using the combination of seasonings for which the recipes calls as well as by the oven roasting. We served this particular batch with some bean patties with a lime-peppered "mayo" sauce. The roasted beets and potatoes are just great and make a terrific side dish for almost any meal. Slice off the root ends and tops of the beets and wash well in cold water. Toss the beets with all the other ingredients to coat well. Place in a single layer in a baking dish, cover with foil, and roast in a 375°F oven for 45 minutes, or until tender. Remove from the oven, let cool, and cut the beets into 1-inch dice. Thoroughly wash the potatoes in cold water and drain well. Slice the potatoes in half, or in quarters if they are large, to form a large dice. Toss the potatoes in the oil, add the rosemary, and season lightly with salt and pepper. Place in a single layer on a baking sheet and roast in a 425°F oven for 25 to 30 minutes, stirring once, or until well browned and softened. Combine with the beets and garlic and serve.